For people who are looking for a simple photo scanner, this could be a viable solution. Those who need greater resolution and scanning power should keep looking for another product. This is a fairly basic and standard lower end product that will work well for beginners. Ideal for personal photos, this scanner is not suited well to the professional photographer. 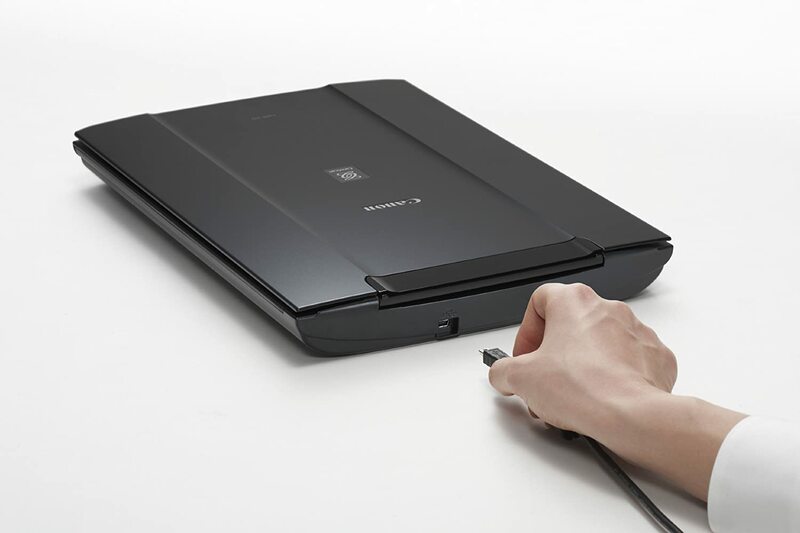 Pros: Canon CanoScan LiDE110's auto-scan mode helps simplify usability by detecting document information and choosing the best setting for the document automatically. The lid expands to better accommodate bulky media, such as books. The scanner works with both Windows and Mac operating systems. The CanoScan LiDE110 provides only a maximum resolution of 2400 x 4000 optical DPI. While this is a decent resolution, many other products on the market offer a better maximum resolution. This product does not scan film and negatives. It is compatible with Windows XP, Windows Vista, and Windows 7. It is compatible with Mac OS X versions 10.4.11 to version 10.6., so it is quickly becoming outdated. 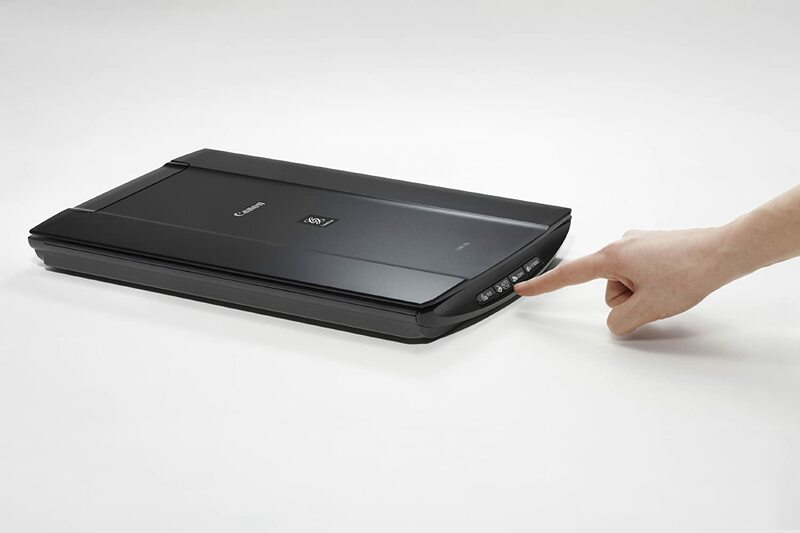 The Canon CanoScan LiDE110 is a flatbed dedicated scanner. It is an Energy Star certified product, which means it does not require a lot of energy to run. Using the included software, you can enhance photos up to an interpolated 19,200 dpi. 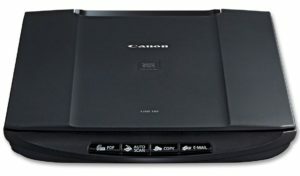 There is a newer version of this scanner available, the Canon CanoScan LiDE120. The newer model shares many of the same features, with additional features to make it easier to use. A single USB cable provides both power and connectivity to the computer. The Canon CanoScan LiDE110 offers four “EZ Buttons” to automate the scanning process. Users can scan, copy, create PDF files, or create email attachments with the push of a button. The autoscan mode Allows the scanner to automatically detect the type of document that is being scanned and change the settings to automatically fit. The original document will be cropped to the proper size, scanned, and saved to the appropriate file format. 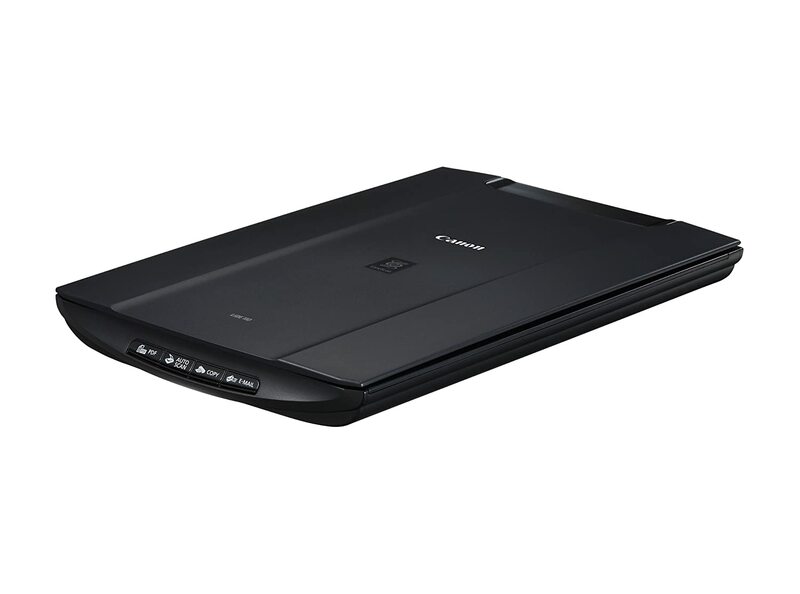 This scanner also features auto document fix which allows correction so that it is sharper, clearer, and easier to read. The Z-Lid feature allows the lid to extend up and over the scanner flatbed so as to accommodate larger items. The one plug scanning feature allows you to reduce the number of buyers in your work area as a single cable provides both the high-speed data connection and the power the unit requires to function. Software is included to help users organize, edit, and store their photos. The editing features of the software are fairly limited, so extensive editing work may need to be done with another program. 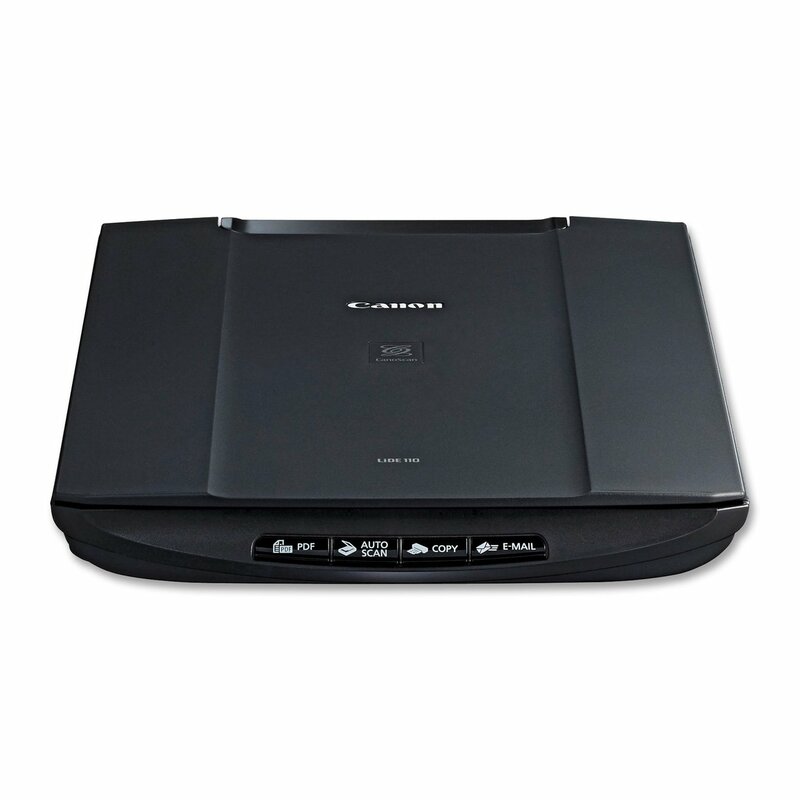 This scanner provides a slightly slower scanning speed compared to some products available on the market. It takes approximately 16 seconds to scan a full 8 x 5” x 11.7” page. Since there is no document feeder, photos must be manually loaded onto the scanner flatbed. The final photo quality is decent, but for professionals who are looking to restore old photos or produce high-quality reprints, there are better options on the market. The scanner quality is satisfactory in terms of photos. When compared to the Canon CanoScan 9000F MKII, it is similar in terms of features, but offers a lower maximum resolution and lacks the ability to scan film and negatives. It is more affordably priced than the Epson Perfection V800, however it lacks the maximum resolution power and the ability to scan film and negatives. Though much more affordably priced than the Pandigital Personal Photo Scanner/Converter, it requires a computer to scan and store the photos, as it does not allow for photos to be saved directly to an SD card. The single cord may make it highly desirable, but compared to the Doxie Flip, it is one cord too many. The Doxie Flip is a cordless, portable, scanner that allows for the lid to be completely removed to accommodate larger items. The Canon CanoScan LiDE110 comes with a one year warranty. Support can easily be found on the official Canon website, where customers can search a knowledgebase for more information about their problem. If the knowledgebase and FAQ does not provide the support needed, customers can get support by email or telephone, as well. An extended service plan, known as Canon CarePAK can be added at the time for purchase for $25, to allow up to three years of full product service and support, from original purchase date. The one-year limited warranty includes the instant exchange program and one year of toll-free technical support. For customers who are looking for an easy to use, compact, flatbed scanner with reasonable quality photos, this is the ideal product. For customers who are less concerned with space, or usability, this scanner doesn’t have much to offer. While the price is most certainly an attractive feature, it may be worth upgrading to the newer version of this scanner for even more simplicity and higher quality features.